First, because these are the first plans I have created in their entirety – no bits and pieces from other bloggers/DIYers – just a photo of a concept piece and my imagination and measurements to bring it to life. Secondly, I’m excited because my previous gift wrap caddy just wasn’t cutting it. Or rather it was doing a great job, but my gift wrap fetish (coupled with a sale at Michael’s) had it so overloaded it wasn’t functional. Attach your side pieces to the 15 1/4″ sides of the base piece. Pre-drill, use wood glue and then drill 1 1/2″ wood screws up from the bottom of the base. I used three screws on each side piece. Using 3/4″ wood screws (or those that came with your castors of applicable) attach your castors to the underside of the base in each corner. Now you’re going to insert the centre divider. This board is going to run from the drawer shelf up to the top of your gift wrap station and will separate the gift wrap rolls from the rest of your wrapping supplies. Measure and mark 8 5/8″ from the front of your cabinet. Using your Kreg Jig, pre-drill holes along the centre divider board – on the side that will be facing the paper rolls (not on both sides). I pre-drilled 3 holes per side. Line up with your markings at 8 5/8″ and screw into place using 1 1/2″ pocket/wood screws. Next we’re going to add the top shelf to the gift wrap caddy. Measure and mark 2 3/8″ down from the top of the centre divider and both sides of your caddy. Pre-drill 2 Kreg Jig holes on each of the four sides of your top shelf. Line your shelf up with your markings and screw into place (on three sides). The last two Kreg Jig holes will attach the front edge to the shelf bottom. The shelf edge piece will cover over the shelf bottom board for a nice, clean look. For your final shelf, you can raise or lower to suit your needs. If you have large gift bags or boxes you might want to skip this shelf altogether. For my gift wrap station I chose to position the mid shelf 8 1/2″ above the drawer shelf. This left me with an almost 11″ opening for ribbon storage etc. Measure, mark and screw into place by creating Kreg Jig holes on the underside and drilling together with 1 1/2″ pocket screws. Attach your 1/4″ MDF board to the back of your gift wrap station using 1/2 wood screws or finishing nails. Because gift wrap rolls come in a variety of lengths (heights), I decided to cut a pocket from my backing using a jig saw. If you choose to do this, measure in 1″ from either side and measure 6″ down from the centre and draw your lines. The caddy portion is finished! You can use some of your excess wood to create dividers in the top shelf section and or in the roll section to keep everything organized. 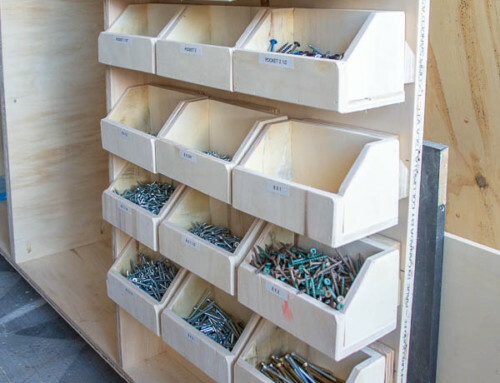 This is my first time building a drawer – and while it works and looks great – if you find plans that are better, feel free to use them. As a beginner, I opted to build a drawer that would fit the base of my gift wrap caddy exactly – without drawer sliders. To that end, you will need to position your drawer sides just slightly inside the outer edge of your drawer front. Think 1/4″ in on both sides. 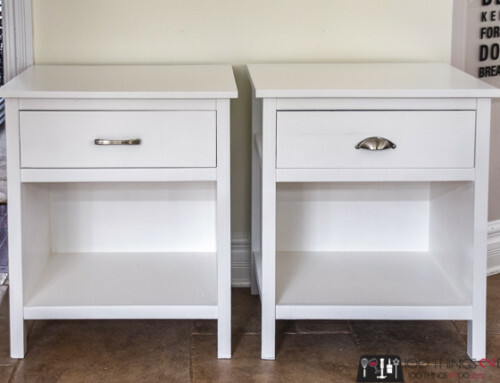 Use your Kreg Jig to create pocket holes on the outside of both drawer sides and on both ends (to attach to the front and the back). Glue, then screw into place. This creates the lip that your last piece of 1/4″ MDF will rest on. Cut your MDF to size and drop into place. (you can glue it down or use finishing nails if you wish). Centre and attach your drawer handle. 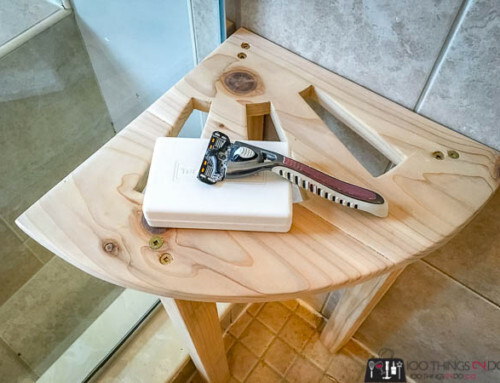 No need to buy fancy dowel holders – you can create your own very easily; Cut a 2″ by 1.5″ piece of 3/4″ plywood and drill a hole in the centre large enough to fit your dowel in – in my case a 1/4″ hole. 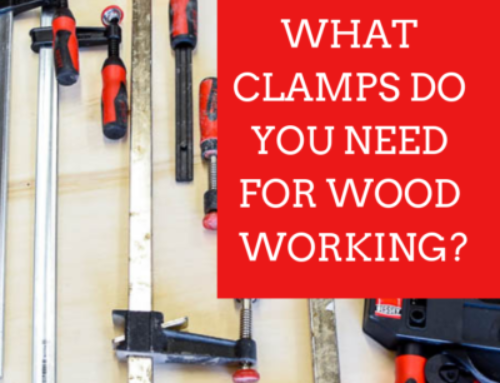 Clamp your piece to a solid surface, or use a vise and then cut from the top of your rectangle down to the outer edge of your circle. Sand smooth and you’re done! Your dowel should drop in easily and be secure enough not to come out when you are rolling out your ribbon. Use wood filler wherever necessary, sand smooth when dry then prime and paint your entire piece. Attach your dowel holders – according to the size of your ribbon rolls and how many you want to hang – by using wood glue and clamping and/or nailing into place. 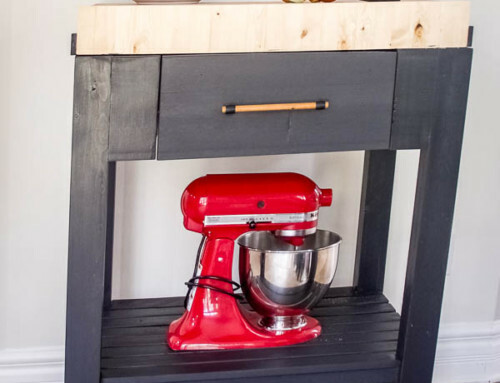 Slide your drawer into place and get to organizing your gorgeous new DIY gift wrap station! My drawer is housing my Christmas boxes, bags and wrap at the moment, but I’ll switch that over as we near the Holidays. The top tray area keeps your scissors, labels, tape and tags close at hand and easily accessible. (Don’t you just love those garden hang-tags? SOOO cute!) I keep cello bags and twist ties here as well for those occasional food gifts. I’ve seen versions for sale for $170 US – if I had to guesstimate the cost of mine I’d say roughly $40 (Cdn) – and that may be high because I have a fair amount of plywood leftover for another project. Not bad for my first “official” furniture design eh? Now go YOU and build your gift wrap station! The Holiday Season will be here sooner than you think and you won’t want to be in the garage getting your wrap on!